Stream Band ring from American Trails. Native American wedding bands are rich in spiritual and cultural symbolism, making them lovely symbols of a couple's love for one another. Find the right wedding band to symbolize your love and celebrate your tribal heritage or connection at the same time. Many Native American ring designs can become gorgeous alternative wedding rings. Couples may choose Native American rings related their heritage, or they may simply admire and appreciate the beauty of the incredible craftsmanship necessary to design this type of jewelry. 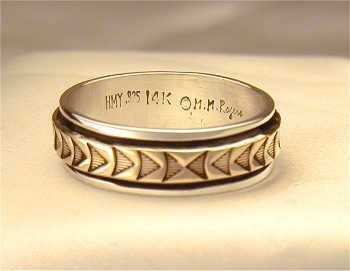 Bearclaw Custom Jewelry makes custom wedding rings with Native American themes. Their rings can be appliqued, engraved or decorated with stones to create a unique piece of art. Costs and wait times vary by size of the ring and the availability of materials. Gold bands start at $250 to $500; stones and specialty engravings add to the cost, as does the thickness of the band desired. Most engraved bands are 1.2 to 1/4 mm thick. Contact them via email to start the design process. Cody Hunter is an award winning jewelry designer who creates intricate silver pieces engraved with stories, symbols and themes. To achieve the various effects, several layers of silver may be used on one ring with intricate cut outs between the layers. All prices on the site are approximate due to fluctuating metal prices; rings start around $650; request a quote for specific prices. To purchase a ring or request additional information, call 800-401-1192 520-529-5545. Arrow Point Ring from American Trails. American Trails carries several different types of Native American wedding bands, including engraved rings, and rings with inlaid stones. Designs include animals and geometric patterns. Most rings take approximately 6 to 8 weeks for delivery. Pricing starts around $150 for the more simple rings and extends upwards of $600 for more complex designs. Eagle Rock Trading Post carries several different rings with engraved designs or inlaid stones. Designs are mostly geometric, although a few have plant or animal themes. All rings shown on the site are in stock and ready to ship unless otherwise indicated. Pricing starts around $50 for simple designs. Touch Wood Rings creates beautiful wedding rings carved out of hardwood and polished to a high shine. The rings are made from various species of wood like birch, maple and walnut. They may be inlaid with secondary wood colors. All rings are custom; you can determine the width, thickness, color and inlay of the ring. Because all pieces are custom, it may take several months to receive your completed ring, although they may make exceptions if you need it sooner. 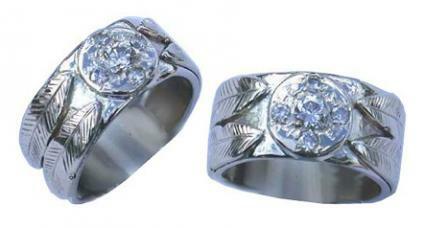 Ring prices start at $450; pricing is determine by how intricate a design you desire, not by material or size of ring. Customers love the beauty and quality of the rings, as well as how well they fit and how comfortable and lightweight they are. 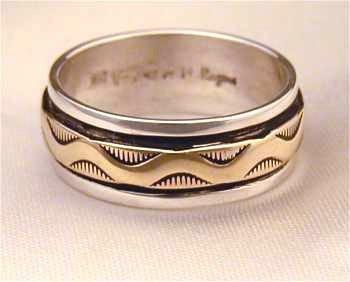 Metals: Many tribal rings are fashioned from silver, though gold and platinum can also be found. Non-metal Rings: Some tribal jewelry artists specialize in non-metal rings that may be considered more closely connected to the land. Wood and hemp rings are increasingly popular, and some rings may be carved directly from stones such as hematite, jade or quartz. Gem Cuts: Whereas contemporary rings use faceted stones almost exclusively, Native American wedding rings are much more likely to use polished or cabochon gems that are smooth and more natural-looking. Carvings: Many tribal designs include engravings, etchings, or carvings of popular symbols such as animals, plants, feathers or images similar to rock art and cave drawings from particular tribes. Colors: Native American wedding bands are far more colorful than their traditional counterparts. Colors were highly symbolic to native tribes, and incorporating blue, red, white, green, brown and other shades adds another layer of meaning to the ring. Stones: The semi-precious gems used in Native American designs are much more widely varied than other rings. Jade, mother of pearl, lapis, agate, turquoise, opal, onyx and other stones are frequently found in tribal rings, whereas diamonds are used far more rarely. Patterns: Geometric patterns of metals and inlaid gems can create subtle symbolism in many tribal designs. Couples do not have to be of tribal descent to appreciate the layered symbolism and natural beauty of Native American wedding bands. Whether they are interested in these ring designs to reflect their heritage or simply to display beautiful tribal artistry, there are many Native American designs to choose that can be as personalized and spiritual as the couple desires.